This paper presents a computationally efficient technique for the computation of exposure distributions at any future time under the risk-neutral and some observed real-world probability measures; these are needed for the computation of credit valuation adjustment (CVA) and potential future exposure (PFE). In particular,we present a valuation framework for Bermudan swaptions. The essential idea is to approximate the required value function via a set of risk-neutral scenarios and use this approximated value function on the set of observed real-world scenarios. 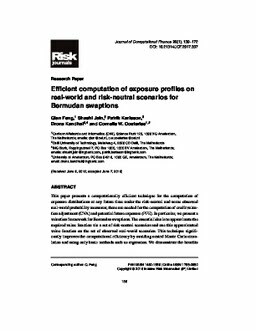 This technique significantly improves the computational efficiency by avoiding nested Monte Carlo simulation and using only basic methods such as regression.We demonstrate the benefits of this technique by computing exposure distributions for Bermudan swaptions under the Hull–White and G2++ models.